LBX' 250 X4 MH material handler is one of two new models now available, with both straight arm and curved-boom configurations. "The new hydraulics package delivers up to 7% faster cycle times than its predecessor," said Adam Woods, LBX Product Manager. "This performance increase is largely due to a new proprietary control valve with a 30% larger hydraulic passage area. But we didn't stop there. We increased the size of arm, boom and auxiliary spools to reduce pressure loss and distribute oil more smoothly." "Two electrically-controlled Kawasaki pumps and one Kawasaki gear pump assure that hydraulic flow gets delivered precisely when and where it's needed. The end result is more smoothness, maneuverability and precision across all operating modes." Woods continues, "All of these performance enhancements don't compromise fuel efficiency, either. A 3% DEF consumption rate, combined with a large DEF tank gives it the longest DEF refill interval in the industry." 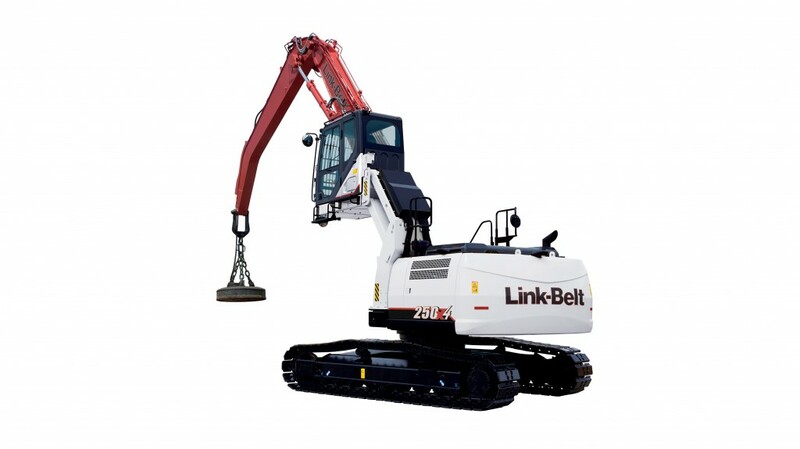 Both new LBX machines also feature a heavy-duty, high-wide undercarriage, oversized turn table, and larger drive motors for dependable, long life service. With any Link-Belt product, the bearing tub extends down through the top plate of the X-Pattern Carbody and is welded to the bottom and top plates of the Carbody for exceptional strength and durability. 600 mm (23.6" in) 3-Bar Steel Grousers, Carbody Belly Pan, Double Track Guard and Sealed Link Chain are standard. Plus, servicing is a snap, with convenient, ground-level access to all routine service points, including sample ports for engine and hydraulic oil. All service ports are easily accessed via hand-turn knobs. The Hydraulic Cab Riser features a higher operator view—16'10" (4.85m) at eye level height. A new in-line drift valve and shock-less cab riser design improve operator comfort and control. For the ultimate in visibility, the Wide Angle Visual Enhancement System (WAVES) can be added. "WAVES is an exclusive, award-winning feature for Link-Belt X4 material handlers and scrap loaders," Woods said. "The system is easy to use and includes three closed-circuit, high resolution cameras that provide a seamless 270° viewing envelope with no blind spots." In addition, a RemoteCARE GPS telematics system allows 24/7 remote monitoring and security. The system enables you to track daily fuel economy and machine performance with ease. It lets you be more proactive if potential failure conditions arise; flashing diagnostic codes on the monitor quickly alert the operator to potential trouble and an e-mail alert is automatically sent. The system also provides machine location in real time for better job supervision and remote security monitoring. A lifetime subscription is included at no extra charge.